Proteins are body building elements required by the human body. They provide the required energy for the body to function properly and are crucial for the development of muscles. Proteins also facilitate the development of nails, a healthy skin and promote hair growth. Protein deficiency has side effects and can lead to medical conditions. Proteins are used every day to keep the body going. Because they’re used to develop, grow and maintain just about every part of our bodies — from our skin and hair to our digestive enzymes and immune system antibodies — they’re constantly being broken down and must be replaced. Vital organs, muscles, tissues and even some hormones of the body are made from proteins. Additionally, proteins create hemoglobin and important antibodies. Proteins are involved in just about every body function from controlling blood sugar levels to healing wounds and fighting off bacteria. Marasmus is a disease caused by a severe deficiency of protein and calories that affect infants and very young children, often resulting in weight loss and dehydration. Marasmus can develop into starvation and cause fatality caused by a lack of essential nutrients. People with marasmus appear bony with little muscle tissue, according to Food4Africa. Kwashiorkor is a disease caused by a severe deficiency of protein in diets that contain calories mostly from carbohydrates such as yams, rice and bananas. It usually affects older children. People with kwashiorkor appear puffy in the abdomen area from retention of fluid, according to the University of Maryland Medical Center. Common symptoms of both marasmus and kwashiorkor include fatigue, irritability, diarrhea, stunted growth and impairment of cognition and mental health. Deficiencies of protein C and protein S are inherited conditions that cause abnormal blood clotting, according to Medline Plus. 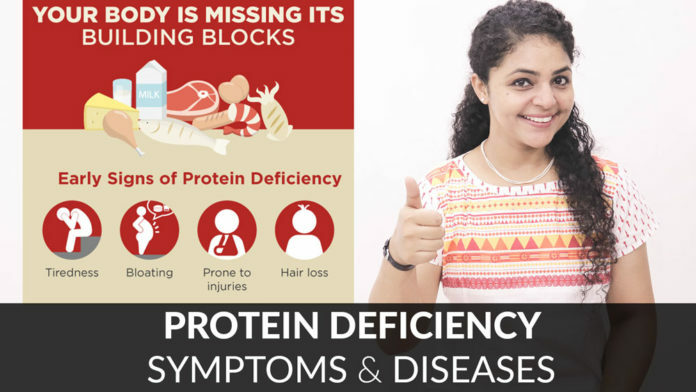 Deficiency of protein C occurs in about 1 out of 300 people. Deficiency of protein S affects 1 in 20,000 people. Symptoms for these deficiencies include redness, pain, tenderness or swelling in the affected area. People with these protein deficiencies need to be careful about activities that increase risk of blood clots, such as prolonged sitting, bed rest, and long-time travel in cars and airplanes. Research by A. Hooda published in the “Annals of Indian Academy of Neurology” in 2009 discovered that protein S deficiency causes ischemic stroke. Cachexia is a condition that involves protein deficiency, depletion of skeletal muscle and an increased rate of protein degradation, according to research by D.P. Kotler published in the “Annals of Internal Medicine” in 2000. Cachexia causes weight loss and mortality and is associated with cancer, AIDS, chronic kidney failure, heat disease, chronic obstructive pulmonary disease and rheumatoid arthritis, according to J.E. Morley in the “American Journal of Clinical Nutrition.” Patients with malignant cancer of the stomach, colon, liver, billiary tract and pancreas experience undernutrition from reduced intake of protein, calories and micronutrients, and have fatigue and a negative nitrogen balance as a result of loss of muscle mass from cachexia, according to J. Ockenga in “Alimentary Pharmacology and Therapeutics” in 2005.